When parents across the board try to find a natural solution to diaper rash, baking soda for diaper rash is usually one of the top recommendations. That’s why today we will discuss why it works! Diaper rash is very common and it’s a form of dermatitis that babies experience during the first six months. It manifests as bright red skin on your baby’s diaper area and it’s often caused by infrequently changed diapers, chafing, and sensitive skin. As you can imagine, diaper rashes are very annoying for the sufferer, so it’s important to know what kind of home treatment works best. In this case, we’ll be taking a look at baking soda for diaper rash, how it can be applied and why it works. Baking soda is often overlooked as a simple baking ingredient, but it’s important to know that it has many benefits and practical uses at home. One of those uses is being a great treatment for diaper rash. One of the common causes of diaper rash is fungal infection and bacteria, so the fact that baking soda is both antibacterial and antifungal make it a great natural solution. Baking soda won’t only prevent infections by making it impossible for fungal strains to adhere to the skin, it will also prevent fungal growth and spreading to other areas. Diaper rashes, just like any other kind of dermatitis, are often very itchy and uncomfortable, especially for babies. Baking soda has anti-pruritus effects, which will eliminate the itching. Another factor that makes baking soda bath for diaper rash so useful is the fact that it restores the pH balance of the skin, which reduces the inflammation caused by this skin condition. Following are 4 most effective ways to use baking soda to get rid off baby’s diaper rash. One of the most common ways to cure baby’s diaper rash quickly is making a baking soda paste. This method is super simple and it’s natural, so you know you won’t be exposing your baby to anything strange. To make the soda paste for diaper rash, all you need to do is take two tablespoons of baking soda, pour it in a small container, add a tablespoon of water, and mix it all together well. You’ll want a soft paste that you can easily apply on the affected area. Make just enough paste for each use, because the paste will dry out, so you won’t be able to save it for later use. Once you have the baking soda paste for diaper rash, apply it on the affected area after washing your baby. Let it sit on the skin for up to 15 minutes and then rinse it off. Pat your baby’s bottom dry and put on a new diaper. Do this once a week until the rash is cleared! 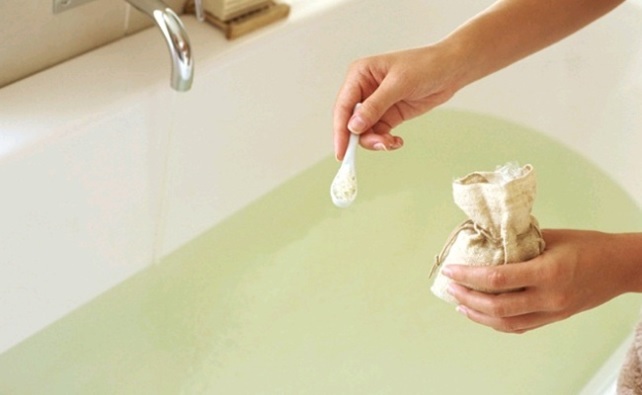 Another way to cure diaper rash is by making your baby a baking soda bath. All you need to do is draw your baby a bath and add 2 to 3 tablespoons of baking soda, depending on how much water you’re using. Make sure the water is nice and warm, and then soak your baby for 10 to 15 minutes. Then, was your baby as you normally would and pat their skin dry. Do this every day for one or two weeks until the rash disappears! Baking soda already has incredible benefits to help you fight your baby’s diaper rash. But if you mix it with yogurt, which has its own antibacterial properties, you’ll be making the treatment a bit stronger. All you need to do is mix one tablespoon of Greek yogurt and one tablespoon of baking soda. Do this every time you change your baby’s diaper to wash your baby’s bottom and then rinse it off with cool water. Do this for up to two weeks! Another great way to make baking soda more potent for curing diaper rash is to combine it with milk and honey. For this treatment, you’ll want to draw a warm bath for your baby and mix in half a tablespoon of honey, a cup of milk and a tablespoon of baking soda. Let your baby soak for 10 to 15 minutes, rinse them and pat them dry with a clean towel. Do this once a day until the rash disappears! In conclusion, baking soda for diaper rash works perfectly and there are many different ways you can apply the treatment. This natural solution will allow your baby to be comfortable again in no time.